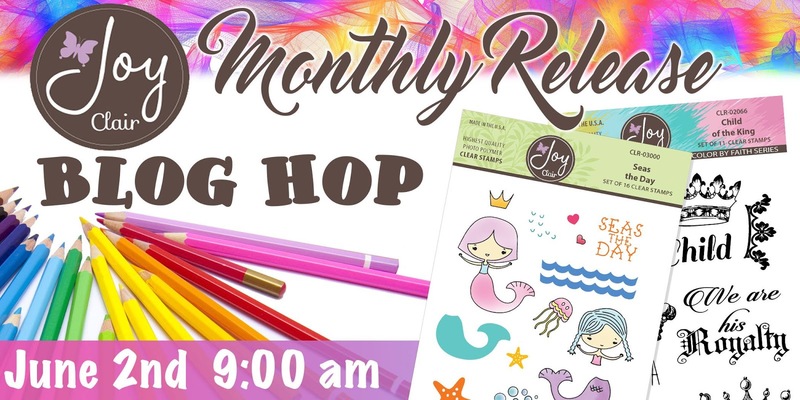 A new month means a new release at Joy Clair and this hop will fill you with inspiration for summer cards and layouts as well as Bible journalling. You should have arrived here from the fantastic blog of Crystal Thompson. To start at the beginning of the hop click HERE. The newest addition to the Color of Faith stamp line is The Child of the King. 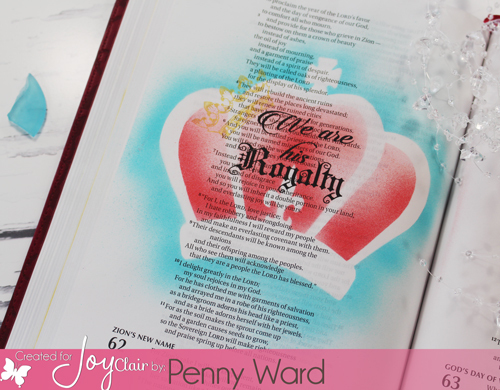 For my Bible page I cut a crown with my Silhouette Cameo and used it as a stencil. Using a Craftwell eBrush, I airbrushed the outside of the crown with a Copic marker, then changed colors for the inside of the crown. Sentiment was stamped with VersaFine Onyx Black ink and small crown was stamped with Delicata Golden Glitz ink to give the page a little shine. Make sure to comment on each blog and become a follower (right side of page- My Talented Friends) as there are prizes to be won. Joy Clair is giving away three $25 gift certificates. Must comment by June 4th. Gorgeous color combo on this beautiful page! Super pretty and what a cool effect! 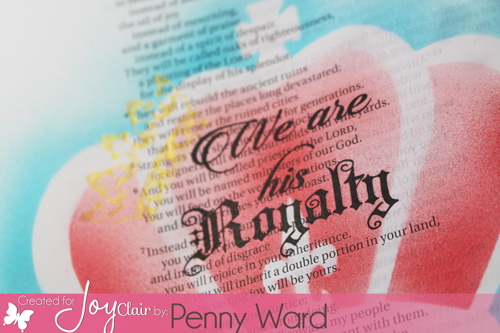 beautiful bible journaling, and LOVE the soft blue fade around the crown. I love the cool color effect you created with the crown! Beautiful card. Lovely use of the stencil and stamp set!